← How does he manage? A street in Bath, England. This entry was posted in Travel Photos and tagged 50 Year Project, Bath, Blog, Blogging, England, Photography, Street Photography, Travel Blog, Travel Journal, Travel Photo. Bookmark the permalink. I loved Bath! It’s a city that has stayed with me. I toured, played miniature golf, and then capped it all off with dinner at the Rat & Parrot. A lovely day. Next time I’ll have dinner at the Rat & Parrot. thanks for the tip! The Rat & Parrot cured my homesickness, too. I was really missing the familiar flavors of home so I ordered a cheeseburger. The meal I got was not the meal I was imaging and it was delicious. I couldn’t help but laugh at myself. I’ve done that many times in foreign places. Order something from home to find that it’s nothing like what I’m used to. It adds to the trip. Glad it was tasty and now you have the memory. 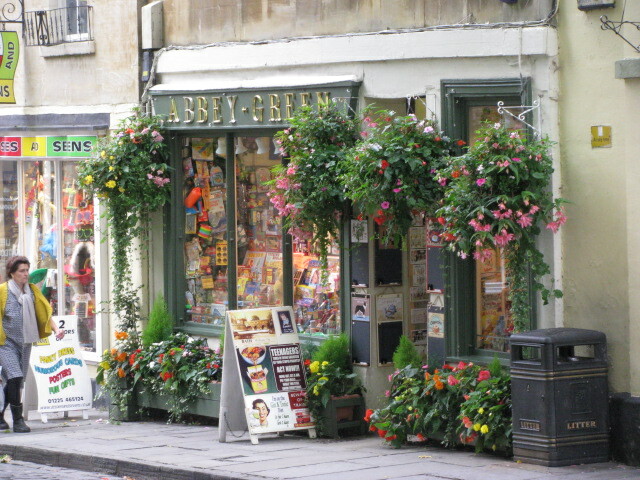 Your image of this sweet little shop completely captures the charm of Bath! It is a charming city. I want to get back there for a long weekend. Thanks Elisa. Cute shop, would love to visit that one. Plants really make a difference. That store seems more inviting than the one next to it. I agree. I went to a pub this week that had plants everywhere, even in the bathroom! And I loved it. So colorful and probably one needs many window stops. We went to Bath for a short break last year and really enjoyed it. It’s a really interesting place and that is a lovely picture. I just adore the plants around the outside. Takes the street scene to a new level. What a delightful place – I’d love to go in there! Such a quaint photo – and what wonderful colours. How lovely it would be to travel to Bath… one day! I love how quaint this place looks!